BIRCHBOX for JUNE 2017 - Face the Day! - Give Me Gorgeous! I just received my JUNE Birchbox in the mail! This month’s theme is Face the Day. June’s products are geared towards the beginning of summer, and being able to put your best face forward (with a smile). You may already have a favorite dry shampoo, or have tried tons of brands like I have, but this amika Dry Shampoo is fabulous. I really like it because it doesn’t make my hair crisp after a spray or weight it down—at all. Another thing many will probably like is that it does not have an overwhelming scent. Birchbox says that it has an Obliphica (which for those who don’t know means Sea Buckthorn Berry or Sallow Thorn plant) scent. But I find that its odor is so slight that it quickly wears off altogether. Rice starch is the main ingredient that absorbs excess oil, while boosting volume. 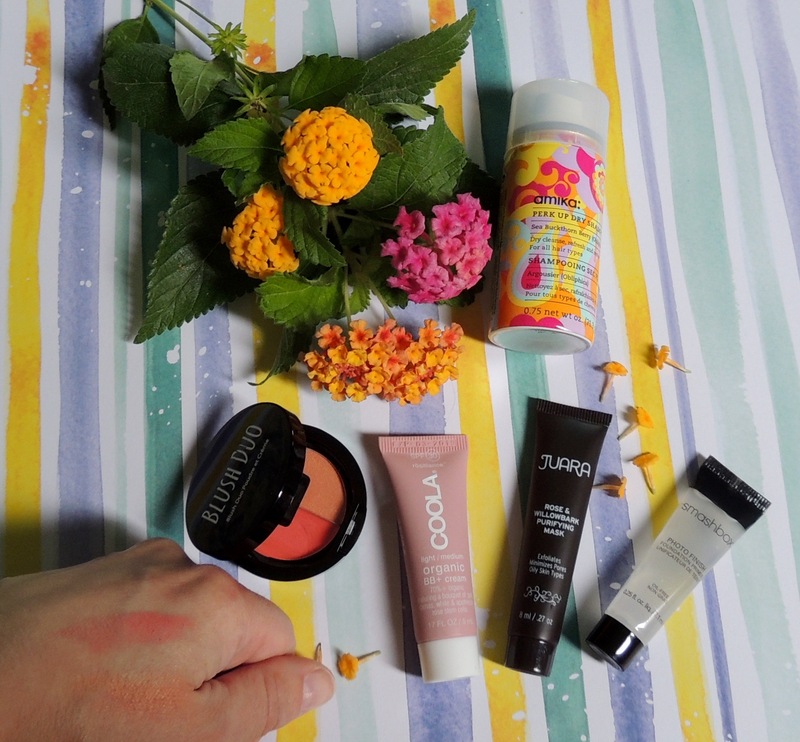 Coola’s mineral BB Cream/Sunscreen does it all. With a sheer tint that is highly bendable, it provides the face with sun protection (SPF 30) and hydration from rose botanical stem cells. The light/medium shade is perfect for me. It comes out of the tube a sheer beige, but because it is so easily blended out–it will work for a very wide range of skin colors. The mask itself is almost a lavender color. Recommended use is 1-3 times a week. Apply it to clean skin, leave on for 10-15 minutes, then rinse thoroughly. And, this handy mask can double as a spot treatment as needed. A long time favorite, one can never have too many of the sample size tubes of this great primer. Clear in color, the Photo Finish primer is oil-free, minimizes pores and smooths skin to create a long-wearing foundation base. If you can’t decide on whether to go with a cream or a powder blush, this duo has both. Both of the shades are topical (with ingredients like papaya and pomegranate) and peachy in color. The cream side goes on very bright, but blends out to whatever your desired tone. The powder side is a little more softly orange with a hint of highlighting pearl. #BIRCHBOX September 2017 - Show Us Your Style! Ive always wanted to try BirchBox out! great post! Check my beauty posts out! Hello Alice! Thank you for visiting, and for your comment. Great products this month! I’m a big fan of the SmashBox Primer! Thank you for visiting!! Certainly a cult favorite — SmashBox primer is great.